If you’re hosting a party or social gathering of any kind, it’s all on you to ensure everything goes as planned. If someone isn’t having a good time, you have to see what’s going on and fix it. Naturally, to keep guests happy at a party, you’ll need lots of good food. Whether you’re hosting a birthday party, picnic, or holiday event, main foods and desserts are perhaps the most important aspects of your planning. What you serve depends on many factors, including the event itself, the time of year, and the guests who will be present. A summer picnic, for instance, would probably feature hamburgers, hot dogs, chips, and soda, whereas pizza might be best for a kids’ birthday party. The food for holiday gatherings will of course be determined by which holiday is being observed. Fourth of July food will be more akin to a picnic, while a Halloween party might feature lots and lots of delicious candy! At any Halloween party, it will be important to stock up on bulk candy, which you’ll want to scatter around the party areas for easy access. Might we suggest bulk Now and Later candy for this? 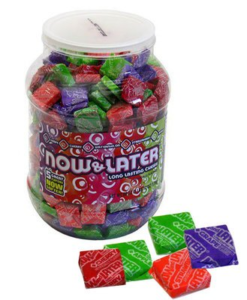 These delicious fruit chews come in flavors such as grape, cherry, and strawberry and are perfect to buy in bulk, as you can get a 400-count jar of them for one low price. Guests will love snacking on these mouthwatering candies throughout the party, and that means your friends and family will always enjoy coming to another one of your events. You can order bulk Now and Later candy at BlairCandy.com.